On November 20th, CatholicTV will air the Vatican consistory where Pope Benedict XVI will install 24 new cardinals. The following day, CatholicTV will air the the concelebrated Mass with the new cardinals where Pope Benedict will give the new cardinals their new golden rings which symbolize the cardinals’ bond with the papacy. These new cardinals will include two Americans- former Archbishop of Saint Louis, Raymond Burke and Donald Wuerl, Archbishop of Washington, D.C. 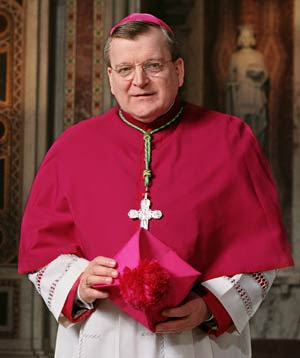 The consistory and the Mass will air at CatholicTV.com and on CatholicTV at noon and 8PM (EST) on November 20th and 21st. Cardinal Seán O’Malley, Archbishop of Boston will discuss the consistory and the new cardinals during his show “Conversations with Cardinal Seán”. This special episode will air during the week of November the 15th at the following times: Wednesday 1:30PM; Friday 4PM; and Saturday 4AM. This will be the third time the Pope has called a consistory to create new cardinals. Pope Benedict has now named 62, or more than half, of the current College of Cardinals. The consistory will be held in the Sistine Chapel. Pope Benedict will concelebrate Mass with the new cardinals on November 21st at St. Peter's Basilica. On October 20th, Pope Benedict said, “The universality of the church is reflected in the list of new cardinals.” Over a dozen countries are represented by the new cardinals, including four African countries, two Latin America countries, two Cardinals from North America, and one representing Asia.